Today marks the 19th anniversary of the death of Marc Aaronson, an astronomer from the University of Arizona. Dr. Aaronson was killed in an accident while observing here at Kitt Peak. This was a tremendous loss to astronomy. Dr. Aaronson was active in many areas of research, from the evolution of stars in our galaxy to the distance scale of the entire universe. He was a highly-motivated researcher who was very enthusiastic about his work. While I never met Dr. Aaronson, his impact upon the people and science at Steward Observatory is still quite visible. I am currently sitting on Kitt Peak National Observatory, on my fourth of five nights with Steward Observatory's 90-inch Bok Telescope. I would like to get pictures of Comet Schwassmann-Wachmann 3, the comet that is currently disintigrating as it nears the sun. Unfortunately, though, our observing schedule is very packed, and there is no time for a "fun" image. So imagine my surprise when I took an image of one of our fields, and there was a bright comet in the corner! It was Fragment C of Schwassmann-Wachmann 3, the brightest of the pieces. The chances of having this appear in our field are pretty small -- our camera covers about one square degree of sky, and there are over 20,000 square degrees of sky visible at any one time! So this was a one in 20,000 chance. Too bad I didn't play Powerball today. A few weeks ago I mentioned how Comet Schwassmann-Wachmann 3 was breaking apart as it rounded the sun, creating a "string of pearls" for this comet, parts of which might be visible to the unaided eye in a very dark site in one month. Today I saw this press release from NASA with Hubble Telescope and ground-based telescope pictures of the ongoing breakup of this comet. Alas, as seems quite common, some people seem wont to blow this out of proportion. A few groups have been stating that the comet is going to smash into the Earth, bringing the end of the world. Let me state unequivocally: Comet Schwassmann-Wachmann 3 will NOT hit the Earth anytime in the foreseeable future, nor will any large pieces of it. It will be passing more than 5 million miles away, 20 times the distance to the moon. How do we know this? It is simple physics, the same physics that allows us to send astronauts to the moon, robots to Mars, and predict where the planets will be in the sky. It just is not possible this comet to go careening out of its course and hit the Earth. So, breathe easy, and late next month, take a trip far from city lights and try to watch this celestial breakup. I'll be sure to keep you posted. So today I am travelling from Stanford Medical Center back to Kitt Peak via an airline that I will not name (but it rhymes with "Bamerica Bwest"). On both parts of this trip, my flights have been significantly delayed. And now I am just hoping I can make it to the telescope before dark so we don't lose much time. Thanks, airlines! And you wonder why we don't want to pay premium airfares? Many astronomers are known for their hard work and dedication to science. But most of us also have lives outside of our research work. Part of the Copernican world view we take makes us realize that astronomy is not the center of our personal universe, but just a part of it. And some times the other parts take precedence. Today I left my astronomy universe, as my tween daughter needed to have some surgery. It was not life-threatening but was necessary nonetheless. Though she went through with flying colors, now she is in the none-too-fun recovery stage, where she's having to go through some fairly intense pain (though the medication helps a lot). Still, as a father, it is very difficult to watch her suffer, and I dearly wish I could wave a magic wand and make her all better instantly. But I can't, and so I feel bad for her. Worse yet, I have to leave her to go up to the telescopes at Kitt Peak for some observing. Neither option is much fun. Anyway, she will be much, much better in a couple of days, and I am greatly looking forward to that. Meanwhile, the Universe can wait. Chances are good it will still be there tomorrow. 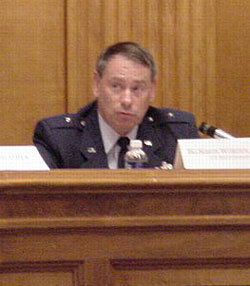 A colleague of mine from here at the University of Arizona, Brigadier General Simon "Pete" Worden USAF (Ret. ), was named director of NASA's Ames Research Center on Friday. I've gotten to know General Worden during my time here in Tucson, and I think he is an excellent choice for this position. He has ideas that many view as unorthodox, and some of which I don't agree with, but he will bring a much-needed breath of fresh air to Ames. Good luck, General! 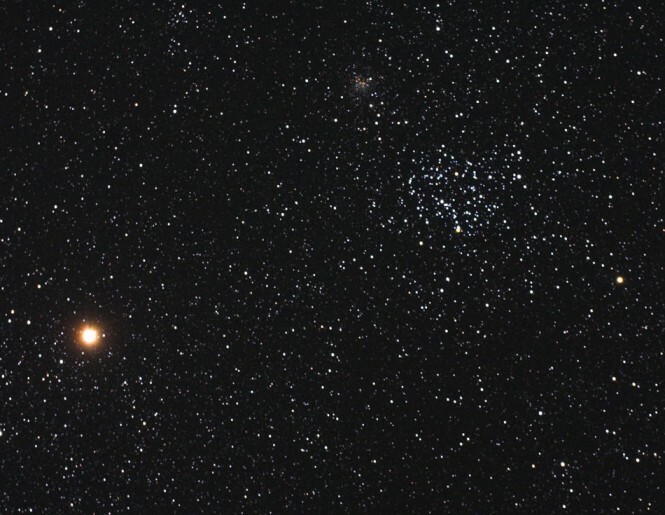 I pulled up today's Astronomy Picture of the Day and saw this photo of the planet Mars drifting past the open star cluster Messier 35. I am quite familiar with this star cluster, as some of my research into white dwarfs has been centered on this star cluster. The cluster is young, as far as star clusters go, being "only" 150 million years old. The brightest stars in this cluster are about five times more massive than the sun. Of course, the very bright, orange object in the APOD is the planet Mars, which wasn't there when I took my image above. I apologize if my picture above looks a little green around the gills. On some computers the sky looks greenish; on others it is black. The green color, if you see it, is just an artifact of how I made the color picture. Last night I gave a public talk here at Steward Observatory, and I talked about my research into white dwarfs. This also is my excuse for a lack of recent blogging, as I have been working on that talk. If you would like to see the talk, you can download the PDF file here. Be warned, the file is big -- 26 megabytes. Also, you don't get to see my cool animations. But, you can't have everything. On Monday I am giving a public lecture on my research here at Steward Observatory. As part of my talk, I want to show a movie explaining how stars change with time, but most of the movies I found on the web were lame. So I decided to make my own lame movie, representing my first attempt at production and direction of a motion picture. This movie is the result of my efforts. (Note it requires Apple's Quicktime player to view.) It shows how the brightness and temperature of stars in a star cluster changes with the age of the star cluster. The diagram, known as a Hertzsprung-Russell Diagram, is often used by astronomers in research. In the diagram, hotter stars are to the left, and brighter stars are to the top. The sun is shown as a big open star, the other points are stars of various masses. As the movie starts, the brightest stars use up their fuel and disappear (as big supernova explosions, which are not shown). Later, fainter and fainter stars use up their fuel, swell up and cool off (becoming red giants), and then shrink into a very hot, dense star called a white dwarf (these are the blue points that appear after a while). The white dwarfs slowly cool and fade, while new white dwarfs are made as more stars use up their fuel and die. I don't expect an Oscar for my efforts, but I'm pretty happy with the results. Comets are dirty snowballs -- loose accumulations of ice and dust formed at the very beginning of the solar system. Comets are on very elliptical orbits -- they spend most of their time in the deep freeze of the outer solar system, but every so often (from a few to many thousands of years), they approach the sun. The sun melts some of the ice, which forms the head and tail of the comet which we see on earth. This year marks the return of comet Schwassmann-Wachmann 3, a comet that orbits the sun once every five-and-a-half years. Eleven years ago, observers from Earth noticed that the comet looked strange -- it was breaking up into multiple pieces. Why? We can't be certain, but comets are pretty loosely held together. It could be that the repeated freezing and thawing of the comet finally broke it apart. This phenomenon is familiar to residents of colder climates, who can watch their streets break up into pot-hole ridden throughways every spring. This May, the pieces of Schwassmann-Wachmann 3 will fly near to the Earth. If you are able to go to a dark field, you may be able to see a string of faint pearls in the night sky! Okay, I'll admit it. The day-to-day life of the astronomer is not always exciting. Most of the time, it is just plain normal. And sometimes we have bad days. Yesterday was one of those here. My work computer slowed way down when one of the processors overheated. I have four processors in the computer, and software to assign jobs to different processors. Somehow yesterday, my software assigned two very intensive programs to the same processor, which proceeded to melt down. So, I had to let my machine cool off for a half hour before rebooting it, and now I am being careful to only run one intensive program at a time. My home computer also decided to die yesterday. The power supply (a box inside the computer case that provides electricity to the different circuit boards and disk drives) was failing, and it managed to corrupt my Windoze programs. So, I had to buy a new power supply and install it. When I went to reinstall Windoze, it told me that because I did not have an earlier version of Windoze installed, it couldn't install (I have the XP upgrade version, which requires you to have Windows already). Only the computer had just gotten finished saying that I had a previous version installed that would get overwritten! After a few attemts (and digging up the CD for some ancient version of Windows), I was finally able to reinstall Windows. But, of course, now I need to re-install every single program I run on that machine, even though they are still on the hard disk. Bill Gates, if you are reading this, I am switching to a different operating system in the future. It demanded a Uranium PU-36 Explosive Space Modulator. We were fresh out, so I suggested he try your house. So, if you see him tonight, I'd suggest you comply. Happy April Fool's Day, all!